Over the years I have had many healings, some instant and some partial, some not so instant and some I am still waiting for. If we were never unwell, how would we ever come to know that the Lord is our Healer? My brother had a brain hemorrhage when he was 18. He was flown from Mt. Isa hospital to Brisbane. There was bleeding from the surgery to stop the original bleeding and he was unconscious for 2 weeks. The brain surgeon told my mother to let him die. She had 5 other healthy children and he would probably be a vegetable, but my mother did not. She moved into the hospital and cared for him, cleaning his teeth etc. I was very upset. I could not stay in the hospital. I went outside and cried. I begged God not to let him die before becoming a Christian. We shifted to Brisbane to be near him. I asked the church to pray for him too and God answered our prayers. Family and friends helped him to walk and talk again and eventually he became a Christian, married and had children. 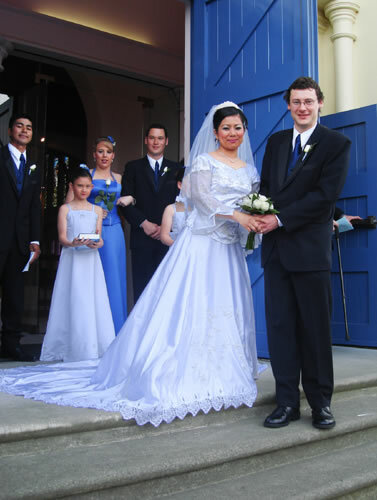 Click to view his first born son's wedding. His other two children are also in this photo. I was an athlete in my teens and early twenties. 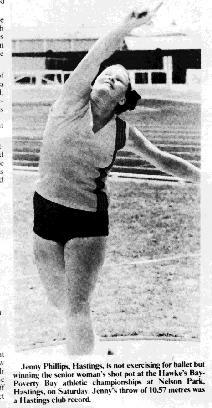 I used to train most nights, as a discus thrower, but I also excelled at some of the other track and field events too. Click to view After some sessions of high jumping I ended up with shin splints, a very painful condition. I decided to visit Milton, the pastor of the church I attended on the way home and ask for prayer. He prayed and said, "God wants you to be wel.l. I thought, "Yes he does." The following day the pain was gone and to this day it has not recurred. While breast feeding my first baby I got a breast infection and because I was becoming more feverish I rang Niven, the minister of the church I was a part of and asked him to pray. He did and immediately the fever left and I was able to feed my baby more comfortably. Over the years on a number of occasions I have rebuked the fevers my children have had and seen them go. A lady failed to stop at the stop sign and drove into my car hitting my back. The pain in my chest was so terrible I thought I was going to have a heart attack. I cried out to God to protect my heart and immediately felt a peace come into it. I told God I wanted to live. My children needed me as their mother. I prayed out loud earnestly and a girl came and sat on the seat beside me. She was reading her book. It was very strange. I didn't know what she was doing in my car. Well it just so happened that a doctor I used to go to was passing by and stopped to see how I was. The pain was still so severe that I was taken to hospital, as I had difficulty breathing and didn't even know that I was bleeding from a few lacerations. The doctor noticed them. The following day or so I was taken to have a shower. The nurse left me and went to wash another patient and I thought I was going to black out. I called out to her and she told me to bend over. I told her I couldn't. She said, "No that's right" but didn't come to help me. I cried out to Jesus and felt a warm sensation strengthening me and I was able to continue standing. The church I belonged to were wonderful. The ladies made a roster to care for our children and house until a few weeks later when I was given home help. I spent most of the following year in bed as I couldn't stand up for long without feeling as though I was going to black out, but I still had the peace and joy of the Lord in my mind. About 2 or 3 years later I was finally able to go out and try some gardening. However every time I stood up after kneeling down everything went black. I was alive inside but couldn't see. It was very black. It felt like the blood supply was being squeezed off in the back of my neck and then everything would go black. One day after this had happened 3 times, I went and sat down on the door step and cried out to God saying I just had to be able to do the gardening. God answered me instantly and I haven't experienced that problem since. About 3 years later I was at the hospital having physiotherapy treatment. The physiotherapist asked if I minded having a student work with me. I said that was ok. Well, it just so happened that the student was a Christian. She had come to our Church with a visiting group. I was sitting on the edge of the bed and she said, "Bend over!" I recognized Jesus in the light around my left side and immediately found myself bending over. This was the first time since the accident that I was able to bend down. After that I was able to do up my shoelaces easily. The following Sunday evening a small group of us were praying together and my body relaxed so much I thought I was going to slip onto the floor. I held on tightly to the chair to stay on it. Afterwards I had more mobility in my body. During the labour of our 3rd child, Roseanne, I couldn't find the muscles needed to push the baby out. This action had been affected during the car accident. Finally I cried out loud to Jesus for help. Immediately I felt strength coming down through my head showing me how to push. The baby had very wide shoulders and the cord was tight around her neck. The doctor cut the cord but couldn't get her out. Finally she was born gray and not breathing. The doctor looked very anxious and unsure of who to help first. He left the baby on the cold table and turned to help me. He wasn't going to help her to breathe. I told him to go and help the baby to breathe and to forget about me. He went back to her and I prayed silently in tongues until she was breathing. The baby was whisked off somewhere and I felt very ill and vomited. The placenta was more like broken up bits of jelly not at all like the firm ones I had had with the previous two babies, so it was a miracle our baby lived. Our baby had a heart mummer and was very big as I had been diabetic during the pregnancy. 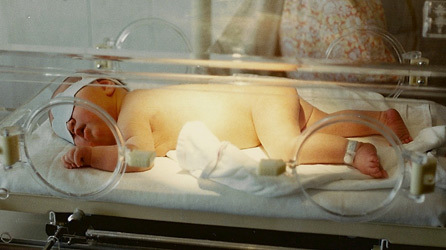 She only just fitted into the incubator. Well, it just so happened that while I was still in the hospital, the leading New Zealand heart specialist was visiting Napier for a few days and it just so happened that he had his special heart equipment with him. So baby Roseanne was able to have her heart checked out. She had a small hole in it that was checked from time to time but he said she was ok. I continued to pray for her and some years later the mummer was no longer heard. Some time after the birth the doctor told me he had been very worried about both of us and hadn't known who to help first. When Roseanne went to school she was tested and discovered to be intellectually gifted which is amazing considering her lack of oxygen at birth and the length of time it took her to begin breathing. Nothing is impossible for God ... He is God and He is Life, resurrection life. After the 3rd (of 5) car accident my memory was affected so I asked Niven, an ex minister to pray that my memory would be improved. The following day I could suddenly see both sides of the road as I drove and later discovered that not only my memory had improved but my peripheral vision had been restored. I hadn't realized that it had been affected until I got it back! I only knew that I had hated driving as I found it very scary and couldn't remember seeing the road signs.